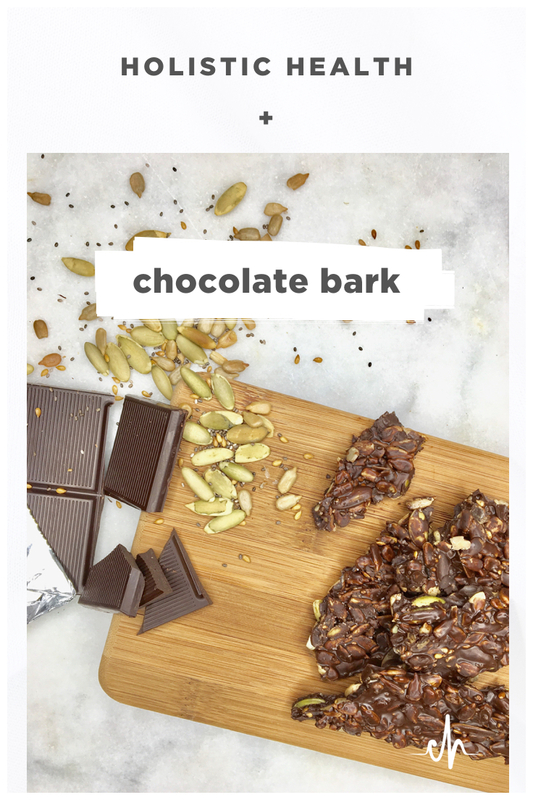 This chocolate bark is seriously too easy. 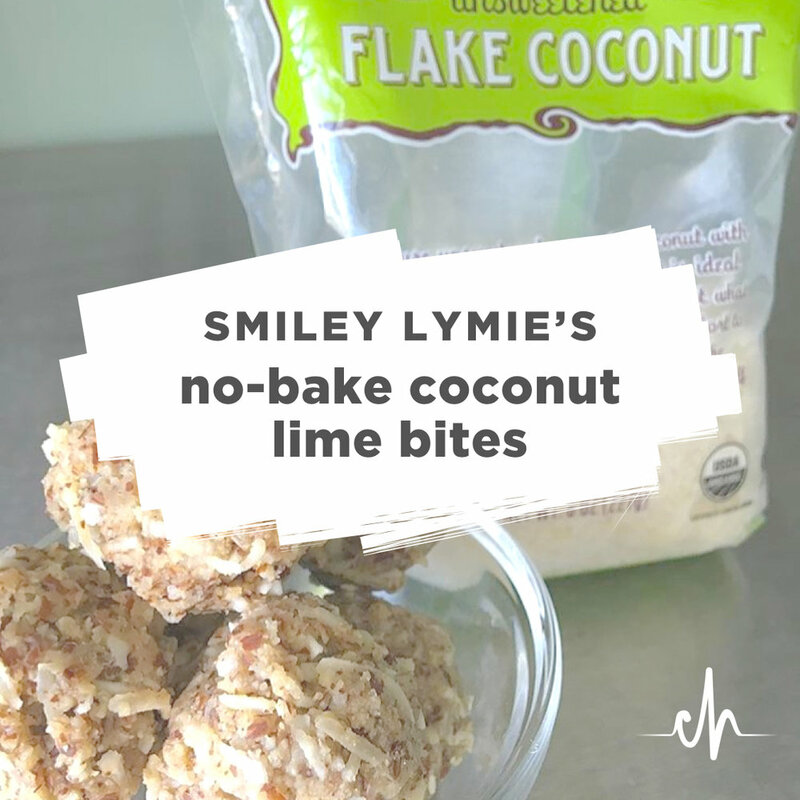 While we were working on our book for Type One Diabetic families I was trying to come up with some creative recipes that satisfied a sweet tooth while still providing some nutrients. This bark is awesome because you get the sweet sensation without a horrible blood sugar spike afterwards. It's also a great way to extend the life of a chocolate bar while getting tons of superfoods at the same time! 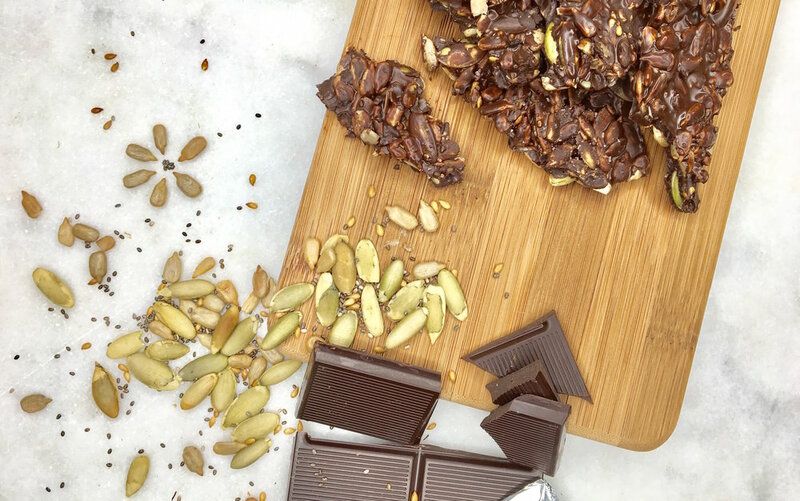 Pumpkin seeds, sunflower seeds, and chia seeds… that’s it. Go to Trader Joe’s and look at all their nuts, seeds, and dried fruit. Essentially you melt the chocolate and coconut oil together, then mix in whatever you like! 1. Microwave the full bar (broken into pieces) and 1 tsp of coconut oil in a glass bowl. Repeat in 30 second intervals and stir in between. 2. Mix in all of your ingredients (nuts, seeds, dried fruit, etc.) until they are covered in chocolate. 3. Spread onto parchment paper and let rest until firm. The bark should take about 30 min to set. Sprinkle with sea salt and enjoy! If it’s summer or if you have the heat cranking in the winter, store in the fridge. For Chocolate Discs: Stir melted chocolate and coconut oil together and use a spoon to drizzle discs onto parchment paper. Then place nuts, seeds, and/or berries on top and let rest until firm. Sprinkle a little sea salt on top and eat up! These are great with coffee. Store in the refrigerator to keep their shape. That’s it! Keep reading for more details if you like. One chocolate bar of your choice. 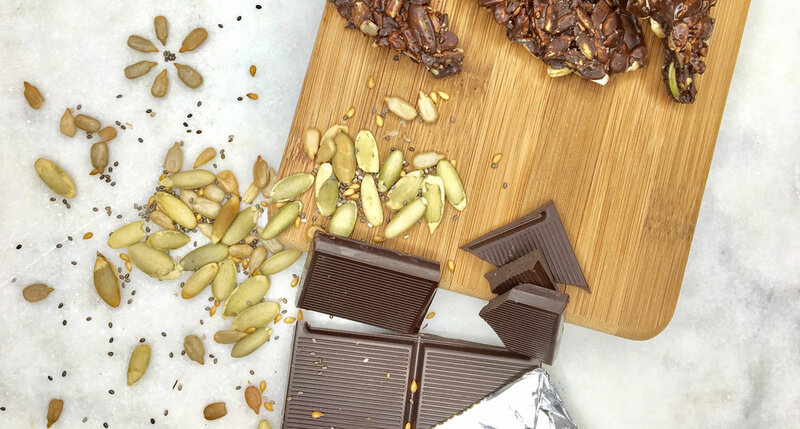 We like to choose a bar that’s above 60% cocoa, or even better one made with cacao nibs. Read cocoa vs cacao here. TLDR: cocoa is the processed version of cacao, without all the raw nutrients. Look for a chocolate bar that has a short ingredients list, and take note of carb count if you have Type One like me! 1 tsp coconut oil. Since you're only using enough heat to melt, we like to use virgin coconut oil (Dr. Bronner's or Thrive brand for example). You can read more about cooking oils here. Add ins of your choice: pumpkin seeds, sunflower seeds, chia seeds, flaxseed, dried berries, nuts...whatever you like! 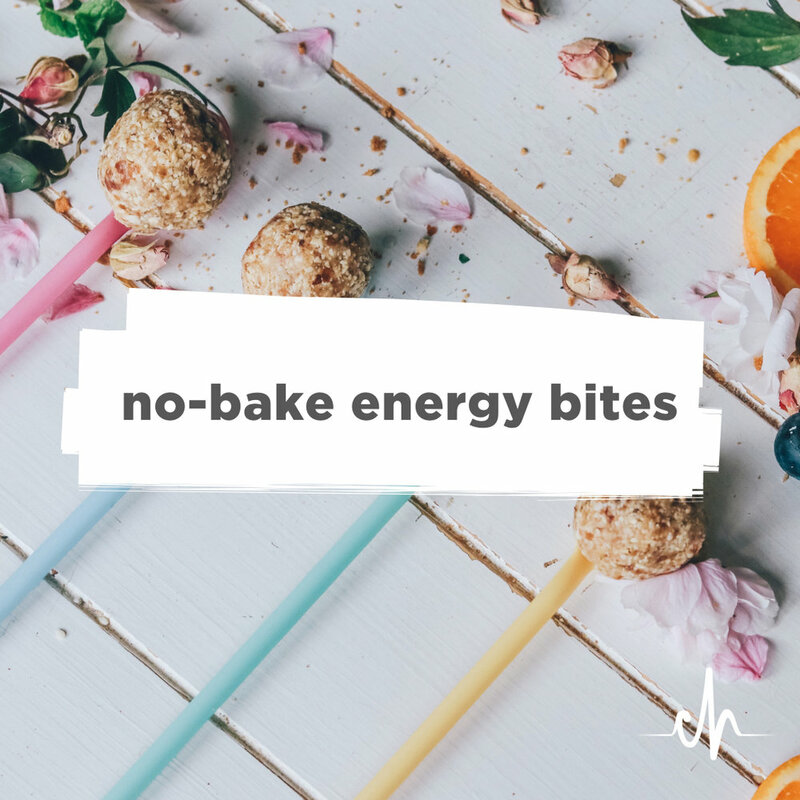 We love adding a drop of peppermint or orange essential oil to give it a delicious hit of flavor. Remember, a little goes a long way! A 15mL bottle contains 250 drops, and you only need one drop at a time. 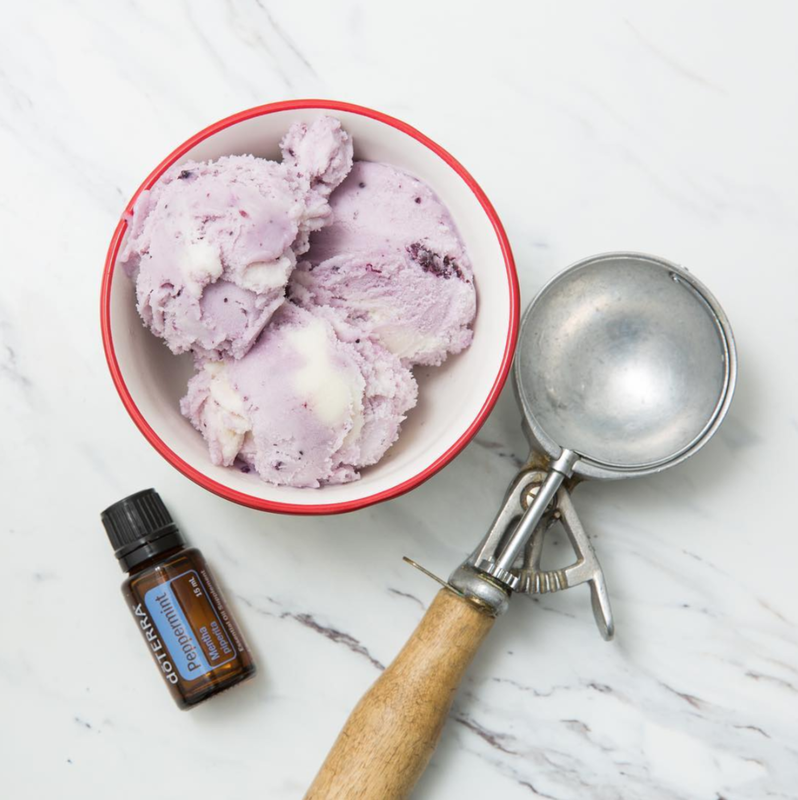 Since essential oils are extremely concentrated–50 to 70 times more potent than the plant itself, and much more potent than extracts–it's very important to use a high quality product. Often, even oils from health food stores are cut with synthetics or untested for impurities. Read more about oil quality here and be sure to check out the kits for the best value. Best bang for your buck? A kit. The wholesale price applies when you buy an enrollment kit, and you have access to wholesale prices for the rest of the year. The kits are incredibly versatile and help you replace so many household products–think skincare, cleaning, seasonal protection, and pain management. 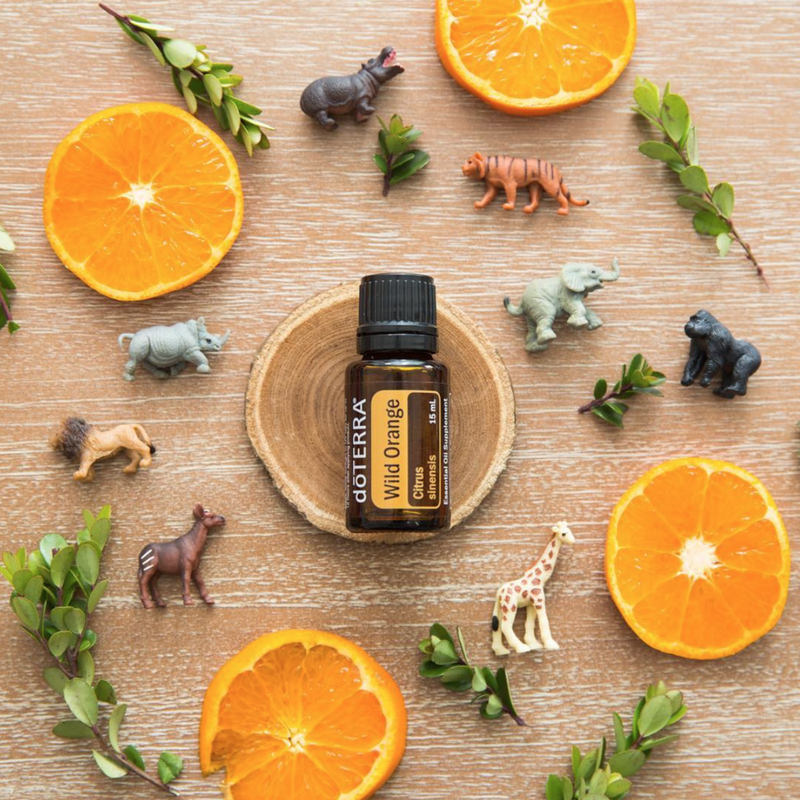 Follow along with us and check our our DIY for tips and tricks for oil use! Peppermint and Wild Orange oils pictured. Why try a kit? Read more here. What are you going to add into yours?! Find us on Instagram and Facebook or leave a comment below!